Hope you can attend the event! Berkeley joins Steinem stone in seeking Justice 4 Jeju. 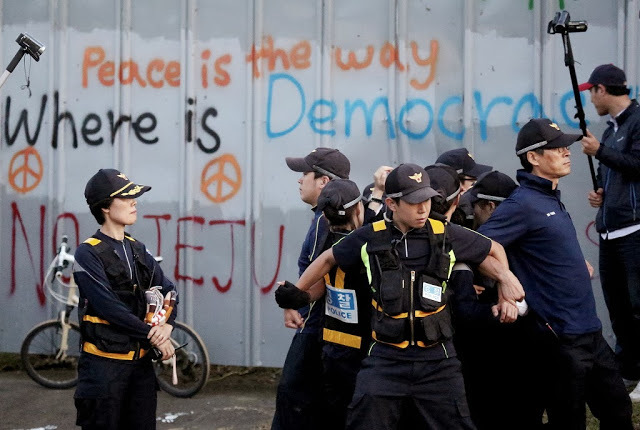 Berkeley made history by becoming the first City in a growing international movement of environmentalists and peace activists to stand up for villagers on Jeju Island in their long struggle to oppose a massive naval base being built on the beautiful island. Affected local villagers have engaged in seven years of principled non-violent struggle, facing endless beatings, arrests, fines, and imprisonment. Most recently, Sister Stella Soh, the first Catholic Nun in Korean history to be arrested for an act of conscience, was arraigned in a Korean court. 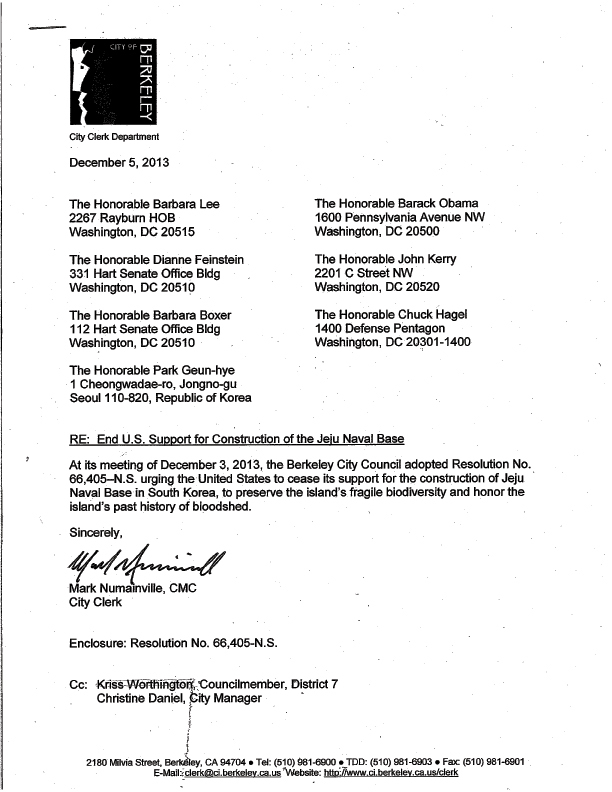 Christine Ahn, a scholar at the Korea Policy Institute, wrote in a heartfelt and moving letter to Berkeley City Council that she had named her daughter Jeju because of her passion for the cause of the peace activists on the island. This great news was recently shared by our devoted peace activists friends in the United States. We so thank to peace-loving citizens in the United States who greatly contributed to passing this resolution. Below you can find a write up of the events surrounding the passing of the resolution. You can also see the whole account and resolution together here. You can find the officially signed City Council resolution at the bottom of this post. On Jeju Island, an environmental jewel sixty miles south of the Korean Peninsula, a massive naval base is being built to house US warships, submarines and aircraft carriers, serving as a key forward base for the “US Pacific Pivot”, and turning the region into a hair trigger for global confrontation. Seven years of principled non-violent struggle by the affected villagers have resulted mostly in endless beatings, arrests, fines, imprisonment; a growing international solidarity movement; but little tangible in the way of political support from any national or local government. 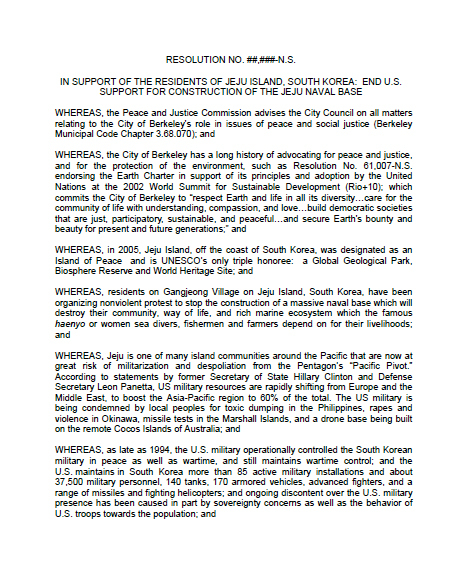 On December 3rd, 2013, the City Council of Berkeley, voted to support the Peace and Justice Commission’s Resolution in support of the residents of Jeju Island and to End US support for construction of the Jeju Naval Base. This makes it the first city in the world to formally declare its support of the Jeju Islanders and its opposition to the base. Despite being stripped out of the consent calendar and placed almost at the bottom of the council agenda–usually procedural maneuvers designed to kill or impede passage–the resolution ultimately passed (with 5 votes in favor and 4 abstentions) in the Berkeley City Council. Council member Kriss Worthington, who had sponsored and fast-tracked the resolution, tabled the two items preceding the resolution, allowing it to be put to discussion and a vote, minutes before the clock ran out. Huge popular support, an unusually vibrant and vocal group of speakers who stayed late into the night–waiting for over 4 hours for the opportunity to address the council for a single brief minute–and a massive flurry of emails from concerned individuals all over the country may have influenced the final vote. Motivated activists from Starr King School, Pacific Lutheran Seminary, from the Berkeley Fellowship of Unitarian Universalists, the Peace and Justice Commission, the Ecumenical Peace Institute, and others made passionate, informed pleas for support of the resolution. An activist in a wheel chair broke down in tears as she implored the council to support the cause of peace. Also significant was a letter from Christine Ahn, a scholar at the Korea Policy Institute and peace activist, who wrote in a heartfelt and moving letter that she had named her daughter Jeju because of her passion for the cause of the peace activists on the island. An earlier version of the resolution had previously been shot down in February by the Council. 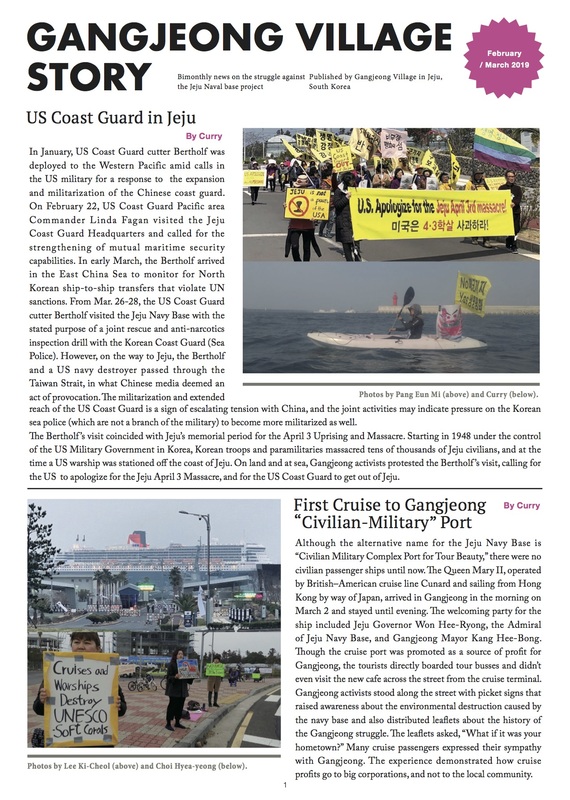 Even as it was drafted by the commission, Thyme Siegel of the Peace and Justice Commission had stated, with a straight face, “It is not our business to tell the South Korean government and military how to defend itself against North Korea and China.”—a howler of ignorance or disingenuousness, refuted by the history of constant, unwanted, and heavy-handed US intervention and influence in the country since its inception, including the original massacre of 30,000-80,000 civilians on Jeju Island; and the continuous history of threat, provocation, and escalation in the area. Council Member Linda Maio attempted to water down the resolution by stripping out references to the Pacific Pivot (despite corroborating statements from the Secretary of State and Defense); references to toxic dumping in bases in the Phillipines, and rapes and violence in Okinawa, (as well as missile tests in the Marshall Islands and drone bases in Australia). In particular, Council Member Maio stated, “Condemning the U.S Military for rapes–I can’t put it in there”, apparently oblivious to the fact that 22,000 rapes and sexual assaults occur within the military annually, a number that itself pales in comparison with the abuse that is dealt out to the general population by an occupying military immunized from local prosecution by Status of Forces Agreements. She also removed information regarding the hardware being deployed (the US Navy’s Aegis Combat System). Council Member Max Anderson, a war veteran, however, put paid to her statement, stated that he had been in Okinawa as a marine, and had witnessed first hand the abuses, the rapes, the violence, and ugliness of the military occupation. Council Member Gordon Wozniak mentioned the recent escalation of hostilities in the pacific with Air Defense Zones, stating that “it was not just about Korea, that it was Japan, China”, and that the supporters of the resolution were “missing the point” [in focusing on Korea]. He did not seem understand that he had just proven the argument of the supporters, that the Jeju base was part of the general escalation of hostilities and projection of force in the pacific, and that its presence would exacerbate regional conflict. 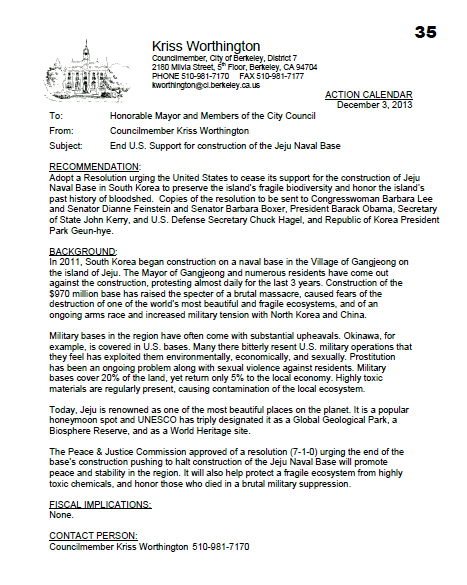 Recommendation: Adopt a Resolution urging the United States to cease its support for the construction of Jeju Naval Base in South Korea to preserve the island’s fragile biodiversity and honor the island’s past history of bloodshed. 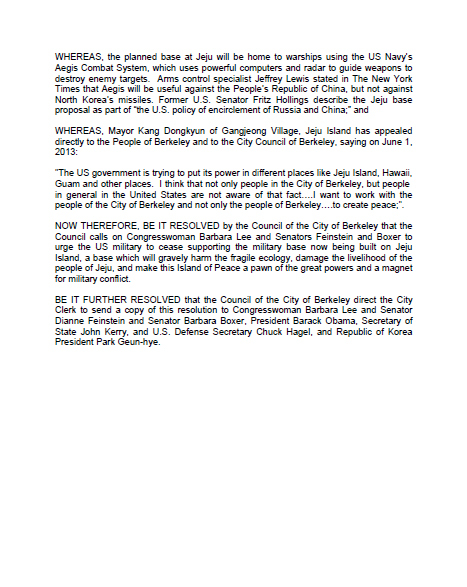 Copies of the resolution to be sent to Congresswoman Barbara Lee and Senator Dianne Feinstein and Senator Barbara Boxer, President Barack Obama, Secretary of State John Kerry, and U.S. Defense Secretary Chuck Hagel, and Republic of Korea President Park Geun-hye. Action: 12 speakers. M/S/C (Worthington/Arreguin) to adopt Resolution No. 66,405 –N.S. amended to delete the fifth and seventh Whereas clauses. Vote: Ayes – Maio, Moore, Anderson, Arreguin, Worthington; Noes – None; Abstain – Capitelli, Wozniak, Bates; Absent – Wengraf. Action: M/S/Failed (Worthington/Arreguin) to suspend the rules and extend the meeting to 11:30 p.m.
Vote: Ayes – Maio, Anderson, Arreguin, Worthington; Noes – Capitelli, Wozniak; Abstain – Moore, Bates; Absent – Wengraf.